The extreme sport of snowmobiling has a happy home in snowy Michigan terrain. Unfortunately, the risks associated with this sport lead to far too many snowmobile accidents, some fatal. Contact a personal injury lawyer at Thurswell Law if you have been injured or lost a loved one in a preventable snowmobile accident. Excessive speed: Excessive speed is one of the leading causes of death in snowmobile accidents, with some machines able to reach over 100mph. Attempting to control a snowmobile moving at a high rate of speed over tricky terrain and on curves can result in horrific crashes where the snowmobile operator and even innocent bystanders are killed. Those who do survive snowmobile accidents often suffer traumatic brain injuries, serious spinal cord injuries, fractures, burns, and other trauma. Intoxication: Alcohol is a major contributing factor in snowmobile accidents that leads to t injuries and fatalities. The snowmobiling community in Michigan, according to the Michigan Snowmobile Association, has adopted a zero-tolerance position on drinking and riding, but that doesn’t mean all riders observe this policy. The highest proportion of alcohol-related snowmobile-related crashes occurs at night among males. Misuse of the machine: Snowmobiles were originally designed as winter utility vehicles that could be used to reach areas other vehicles could not. 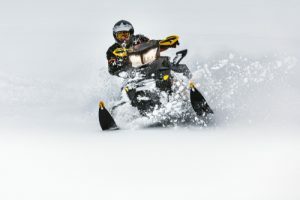 Since snowmobiling has become a recreational activity, the activities reserved for these machines range from trail riding to racing, freestyle to mountain climbing. Without proper training and experience, snowmobile riders who attempt to do more on their machine than they are trained to do can cause disaster for themselves and other riders. Inexperience: It is not surprising for a snow enthusiast to engage in sledding, skiing, snowboarding, or snowmobiling. But knowing one snow activity does not make you an expert at another. Inexperienced snowmobile riders are not always prepared for the speed and power of the machine they’re operating, and they may push the boundaries and engage in reckless driving. It can be difficult to get a snowmobile to stop and challenging to navigate trails at high speeds, especially for new riders who are unfamiliar with the countless hazards they will encounter on their ride. Poor protection: Moving at fast speeds on snow and ice call for caution in all ways, including equipment. Riders that suffer injuries in a snowmobile accident often were not wearing an approved helmet, gloves, goggles, and protective winter clothing. In some snowmobile accidents, riders take every precaution and operate their machine carefully and appropriately, but a faulty machine may point to the snowmobile manufacturer as the negligent party. Just like on the highway, some snowmobile crashes between two snowmobiles occur because of one driver’s negligence. In some cases, privately owned trails designated for snowmobile use are poorly maintained and lead to accidents. There are, unfortunately, snowmobile crashes that involve motor vehicles too. You can operate a snowmobile at the age of 12 in Michigan but must have in your possession a snowmobile safety certificate. This rule applies to the age of 17. In lieu of a safety certificate, the rider must be supervised by someone over the age of 21. Considering the strict laws that individuals must go through to become licensed to operate a motor vehicle, the lax requirements surrounding snowmobiling are cause for alarm and caution. It is recommended that snowmobile operators complete a snowmobile safety training course, but individual behavior and responsibility are the key to making snowmobiling safe. No rider should go beyond their abilities simply for the sake of thrill-riding. Do not ride on the highway or main roads. Keep alert for pedestrians, animals, other vehicles, fences, and wires. Avoid crossing frozen bodies of water. Exhibit extra caution if riding at night. Plan your route and check weather conditions. Get familiar with the terrain and stay on the trail. If you have lost a loved one in a snowmobile accident, you may have a case of wrongful death or negligence. If you suffered catastrophic injuries in a snowmobile accident because of another driver’s behavior or faulty machinery, contact a snowmobile accident lawyer at Thurswell Law for a free consultation. We don’t charge any fees unless you collect. Call (248) 354-2222 today.